Netplaces is the dominant doggie network providing the only complete spectrum of dog news, dog training, nutrition, dog show judging, and fully vetted canine health information. The NetPlaces Network guarantees results for your product, service, show dog or breeding program - or your money back! Each site is top ranked in all major search engines. You may have advertised in other formats with disappointing results. That won't happen here. The NetPlaces Network founders attended the 1998 Dallas NAB (Nat. Assoc. Of Broadcasters) Conference as guests of Lawrence Lindsey who gave the feature seminar "Presenting Network News." It was there that the Andrews met Ted Turner (founder of Turner Broadcasting and CNN). Inspired and encouraged by media giants, Bill Andrews decided the emerging "internet" was ready for a dog-site. Indeed, the sport of dogs welcomed broad-based dog news, health, training, and performance information. TheDogPress.com has more subscribers (currently over 28,000) than any print or digital competitor and The NetPlaces Network has more real people* visitors (1.6 million individuals per Google Analytics) than any canine competitor. TheDogPlace.org is the world's first dog-site (1998) and it beautifully bridges the gap between pet owners and dog sports enthusiasts. 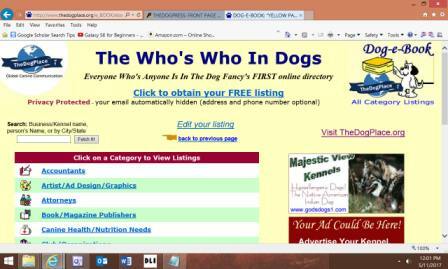 TheDog-e-Book is the world's first (2000) dog-related directory. "Everyone Who's Anyone Is There" and instantly found. 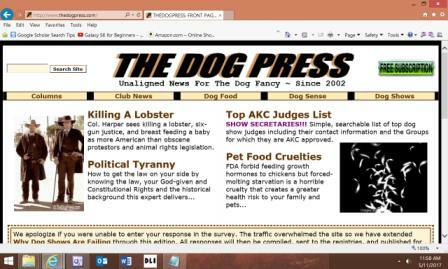 TheDogPress.com launched in 2002 as the first online dog news by and for the global dog fancy. TheJudgesPlace.com went live in 2005 serving AKC, UKC, and international dog show Judges Education and communication. What Are The NetPlaces Demographics? Purebred dog owners seek quality, esthetic beauty, and optimum health for their pets and themselves. Dog breeders, professional handlers and judges are interested and involved in every aspect of canine care. Dog show exhibitors are affluent, well educated, and highly mobile, i.e. RVs outnumber autos at dog shows. Dog owners are universally style and status conscious which is why the U.S. pet industry grew to over $81 billion in 2017. The NetPlaces Network is #1 and when you put ad size and cost in the same sentence, the advantage is staggering. We welcome your product, service, latest win or litter announcement. Your message will be seen within a week! You are limited only by your imagination, not by technology. Explore the options!